Based on the well-established Eurolyser solo veterinary analyser, the CUBE-VET combines the workforce of its proven predecessor with the sleek, light and compact design of our CUBE medical point-of-care instrument. 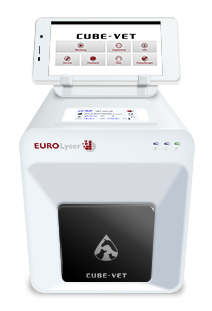 Furthermore, the CUBE-VET is able to effortlessly sync and transfer test results to a variety of systems (PC, LIMS, …) and hence is perfectly prepared for modern data management. 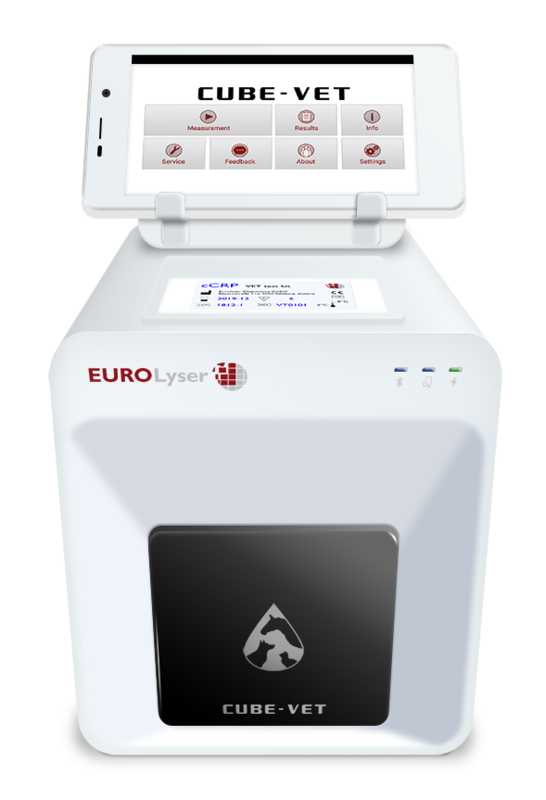 The EVOS (Eurolyser Veterinary Online Services) perfectly round up the CUBE-VET’S connectivity features. Measurement results are easily synchronizes with our own servers, making them accessible from anywhere, fast and secure. Pull the protection foil off the CUBE-VET or instrument’s door and store it in the box. What type of regular maintenance does the CUBE-VET instrument require? The CUBE-VET instrument has been designed to be maintenance-free – it does not require any regular maintenance. The instrument is calibrated at the factory and has an internal self-check procedure during every measurement to ensure that it is functioning properly. The calibration curve, the expiry date or the cut-off value for each test is encoded on the RFID card provided with each test kit. The CUBE-VET has embedded software and new versions are released for free when new features (such as new user information, new tests, new languages) or functionality improvements are added. If you like to use the new features, all you need to do is updating the CUBE-VET app. The procedure is just as simple as updating any app on an Android phone: go online and press “update”. If you intend to continue using the CUBE-VET instrument as is and do not need new features, there is no need to update the software. New software updates are automatically pushed on to your CUBE-VET tablet PC as soon as you are online (e.g. connected to a wireless network). Just follow the instructions on the display.